The Instant Messenger MSN Messenger prevents a user from starting multiple instances of the application. Running multiple instances might be useful for users who want to use different accounts for business and private contacts, two separate businesses or for other purposes. The idea here is to divide contacts into different accounts so that it is easier to keep an overview over them and not confuse private with business matters. It would be possible to use two different clients, for example MSN Messenger and Meebo to connect with two different user IDs but that would mean to cope with two different applications. 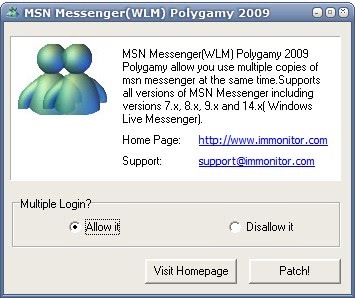 A more straightforward way is offered by the MSN Messenger tool Polygamy which patches MSN Messenger so that it can be run in multiple instances. The software is able to patch various versions of MSN Messenger and Windows Live Messenger including the latest official releases and several beta versions of the Instant Messenger clients. The MSN Messenger patch comes basically with two switches, one for enabling multiple logins and one to disable the feature again. All the user needs to do is to make the selection and click on the Patch button to patch the file. Update: Polygamy supports all recent and not so recent versions of Microsoft's Messenger product - called Windows Live Messenger currently and previously MSN Messenger. The latest version is available on the official project site where it can be downloaded to the local system. Please note that Microsoft announced the termination of its messenger software in favor of Skype which it acquired some time ago. The Polygamy software won't work with Skype currently. You can check out a similar program for Skype that lets you run multiple Skype instances on the same computer system. Here again you may want to separate business and private contacts from each other. also Messenger plus live has the same function along with all the other features included in it.